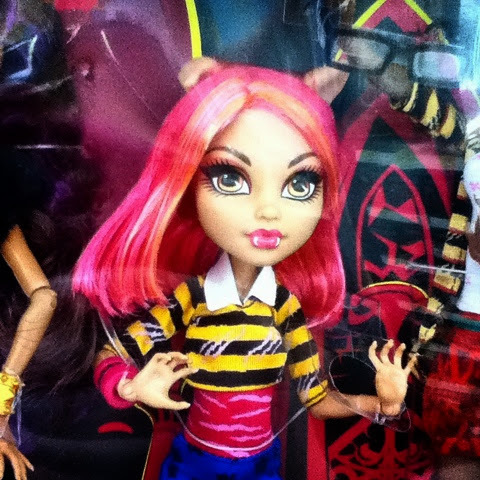 Have you seen this years WalMart exclusive Monster High set? It is the Pack of Trouble featuring four members of the Wolf family. The set features Clawdia, Clawd, Clawdeen and Howleen as they are getting a photo done together. 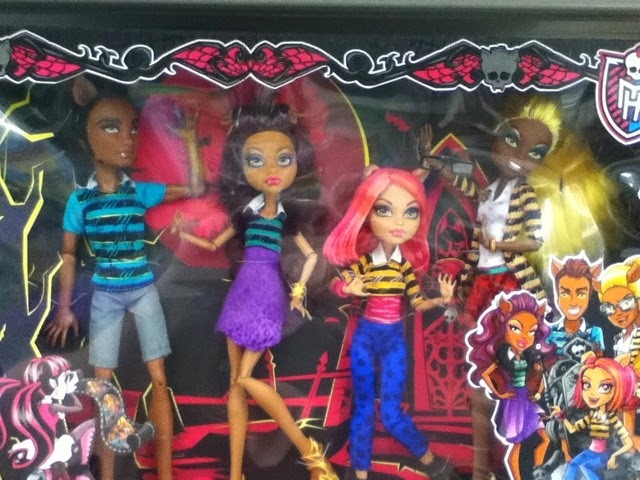 They are all wearing striped shirts and the box art has Draculaura taking the photos. The box also mentions that they are glad it's just the four of them because when its the whole family things get crazy. Are you planning on adding this set to your collection? With stores starting to prep for the holidays we are getting all sorts of new releases from various doll companies and lines. Madame Alexander now has their 7 inch tall, articulated(! ), mini dolls for sale on their website. The line is titled Travel Friends and the dolls represent girls from different countries. 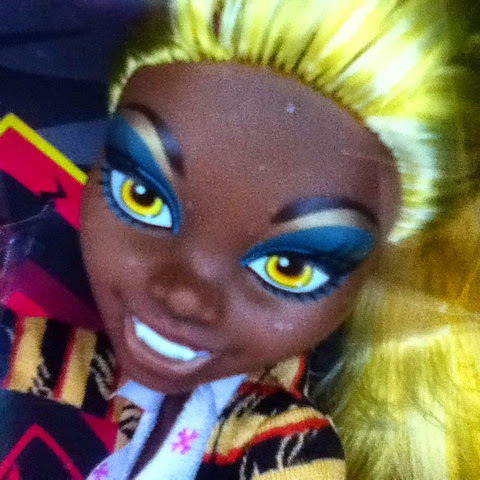 I love dolls that represent other cultures, Global Friends were a favorite of mine as a tween. 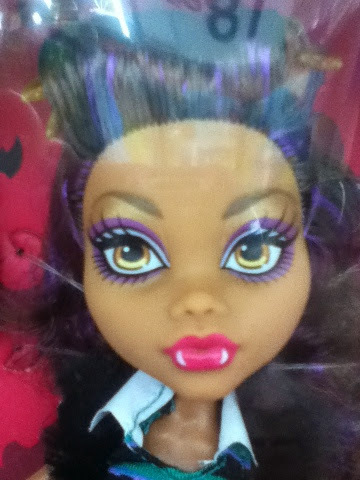 These dolls are very detailed and have cute outfits. My favorite is Nihao, her hairstyle and outfit are very nice and she seems to have a sweet almost serene expression. 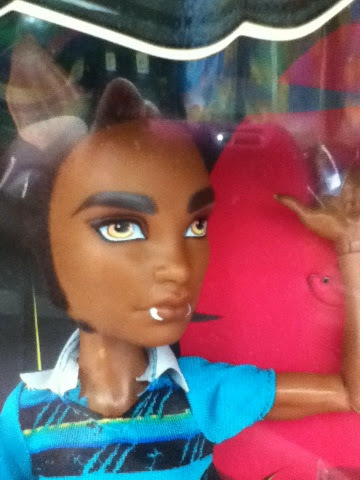 They also have some new 18 inch dolls coming out soon, I'm sure before the holidays. Silver Glam and Glamour in Lace are my favorites of the upcoming 18 inch dolls. They also have their own 18 inch versions of Anna and Elsa from Disney's Frozen available ( they also have these in the Cissette style). I would like to see the 18 inch Frozen dolls compared to the other large scale Frozen dolls available. On a side note I just realized a few days ago that the My Life As dolls are no longer being produced by Madame Alexander. Do you have any favorites from the new Madame Alexander products? What would you like to see in future releases? On Thursday American Girl did their annual holiday release. The release included the holiday outfits, new pajamas for My American Girl and Bitty Twins, a horse drawn carriage,an ice skating outfit, a ski outfit and a few more items. I think the carriage is lovely, and I like that it has some metal parts and isn't completely plastic, but the price is a big turn off. The Bitty Twins Nutcracker themed pajamas are adorable, especially the toy solider one set. I really like both of the holiday dresses this year. The dark blue is really pretty and the tulle peeking out is a nice touch. The silver one has a simple elegance to it with the tiers of ruffles and is my favorite of the two. I think this is the second year that American Girl hasn't released a red holiday dress for the dolls and I'm really enjoying having something different. What do you like best from this release?